Réunion (French: La Réunion, pronounced [la ʁe.ynjɔ̃] (listen); previously Île Bourbon) is an overseas department and region of France and an island in the Indian Ocean, east of Madagascar and 175 km (109 mi) southwest of Mauritius. As of January 2019, it had a population of 866,506. Réunion from space (NASA image): The three cirques, forming a kind of three-leafed clover shape, are visible in the central north west of the image. 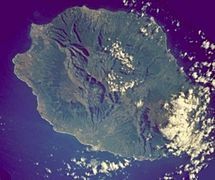 Piton de la Fournaise, in the south east, is covered by cloud. L’Ermitage les Bains lagoon in front of Saint Paul, and its pass through the coral reef. ^ a b INSEE. "Estimation de population par région, sexe et grande classe d'âge - Années 1975 à 2019" (in French). Retrieved 2019-01-19. ^ a b "Gross domestic product (GDP) at current market prices by NUTS 2 regions". Eurostat. Retrieved 2019-04-08. ^ a b Tabuteau, Jacques (1987). Histoire de la justice dans les Mascareignes (in French). Paris: Océan éditions. p. 13. ISBN 2-907064-00-2. Retrieved 2011-06-11. ^ Jean-Jacques Martial (2003). Une enfance volée. Les Quatre Chemins. p. 113. ISBN 978-2-84784-110-7. Retrieved 2012-09-13. ^ "Island disease hits 50,000 people". BBC News. 2 February 2006. Retrieved 2007-08-18. ^ "Madagascar hit by mosquito virus". BBC News. 6 March 2006. Retrieved 2007-08-18. ^ "Lunch at Plage de Boucan Canot". Flickr. Retrieved 2016-11-15. ^ CEROM. "Comptes économiques rapides de La Réunion en 2017" (PDF). Retrieved 2019-04-09. ^ "Comptes économiques définitifs de La Réunion" (in French). INSEE. 2017. Retrieved 2018-03-13. ^ a b "Le chômage et son halo augmentent en 2018". INSEE. Retrieved 2019-04-09. ^ "Quatre Réunionnais sur dix vivent sous le seuil de pauvreté" (in French). INSEE. 2017. Retrieved 2018-03-12. The following is a list of the 24 communes of the Réunion (an overseas department of France), along with the arrondissement (district) in which they are located, and the intercommunality of which they are a member. Didier Robert (born 26 April 1964) is a French politician who is a member of the Republicans party. He represents the island of Réunion, and was a member of the Union for a Popular Movement.Robert has served as President of the Regional Council of Réunion since 26 March 2010, succeeding Paul Vergès. The sport of Association football in the country of Réunion is run by the Réunionese Football League. The association administers the national football team, as well as the Réunion Premier League. 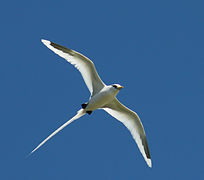 The Mascarene Islands (English: , French: Mascareignes) or Mascarenes or Mascarenhas Archipelago is a group of islands in the Indian Ocean east of Madagascar consisting of Mauritius, Réunion and Rodrigues. Their name derives from the Portuguese navigator Pedro Mascarenhas, who first visited them in April 1512. The islands share a common geologic origin in the volcanism of the Réunion hotspot beneath the Mascarene Plateau and form a distinct ecoregion with a unique flora and fauna. The Open de la Réunion is a tennis tournament held in Réunion since 2011. The 1st constituency of Réunion is a French legislative constituency on the island of Réunion. The 2nd constituency of Réunion is a French legislative constituency on the island of Réunion, represented by Huguette Bello since 1997. The 3rd constituency of Réunion is a French legislative constituency on the island of Réunion. The 4th constituency of Réunion is a French legislative constituency on the island of Réunion. The 5th constituency of Réunion is a French legislative constituency on the island of Réunion. The 6th constituency of Réunion is a French legislative constituency on the island of Réunion. The 7th constituency of Réunion is a French legislative constituency on the island of Réunion. The Réunion Premier League or Championnat de La Réunion de football is the top division of football on the French overseas territory of Réunion. The league is run and managed by the Réunionese Football League under the watch of the French Football Federation. Réunion Premier League was created in 1950 and the most successful club is JS Saint-Pierroise, who have won 17 league titles. The defending champions are JS Saint-Pierroise. The winner of the competition earns a berth in the CAF Champions League. In the French pyramid system, the Réunion Premier League is positioned in the Division d'Honneur, the sixth level of French football. The league has produced several professional Ligue 1 players, as well as players who have gone on to have successful careers abroad. Players such as Jean-Pierre Bade, Guillaume Hoarau, Florent Sinama-Pongolle, Dimitri Payet, and Jean-Pascal Fontaine all began their careers on the island before achieving success abroad. The Réunion national football team (French: Sélection de la Réunion de football) is the regional team of the French overseas department and region of Réunion and is controlled by the Réunionese Football League, local branch of the French Football Federation. Réunion is not a member of FIFA and is only an associate member of CAF, and is therefore not eligible to enter either the World Cup or the Africa Cup of Nations. However, it has played numerous matches, most of them against the island nations of Madagascar, Mauritius, and the Seychelles. The Réunion women's national football team is the national football team of Réunion, a French island, and is not recognised by FIFA. They have played international matches against Egypt, South Africa, Zimbabwe, Uganda and Mauritius. There is a two-level women's league in the country, with promotion and relegation between each division. They have similar development issues to the rest of Africa. Saint-Denis (French pronunciation: ​[sɛ̃.də.ni], or unofficially Saint-Denis de la Réunion for disambiguation) is the préfecture (administrative capital) of the French overseas region and department of Réunion, in the Indian Ocean. It is located at the island's northernmost point, close to the mouth of the Rivière Saint-Denis. Saint-Denis is the most populous commune in the French overseas departments. At the 2016 census, there were 204,304 inhabitants in the metropolitan area of Saint-Denis (as defined by INSEE), 147,920 of whom lived in the city (commune) of Saint-Denis proper and the remainder in the neighbouring communes of Sainte-Marie and Sainte-Suzanne.